See The "Award Winning" & "Best Selling" Creative Counseling 101 eBook Here! Learn everything you need to know about bringing creative counseling to life in your private practice, clinical setting, or school counseling program with "Creative Counseling 101 eBook"! - Graduate School Counseling book used by hundreds of graduate counseling students! Learn what they teach in Creative Counseling Classes at a major university! - "This eBook is excellent for the beginning counselor as well as the seasoned therapist! , Dr. Coleen Roberts, Georgia State University College Professor. 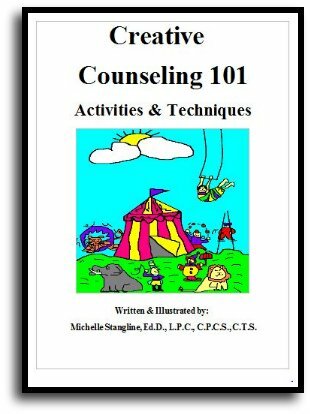 "I wish I had this Creative Counseling 101 eBook when I first started out as a counselor. It would have made therapy so much better for my clients and for myself!" Sonja Webb, Licensed Professional Counselor. Get Even More Creative Counseling Techniques and Activities for only $39.95! Learn even more about Creative Counseling 101 techniques in this 159 page book. This colorful book has even more ideas to help you become the best Creative Counselor you can be! It's a very simple download, but if you have any trouble at all, please me personally at mstangline@gmail.com and I will be happy to help you. This book comes in an instant PDF file and can be opened easily with Adobe reader. Please see below for information using credit cards.... Visa, Master Card, Discover, American Express credit cards, Debit cards, and PayPal are all accepted. 1. Hit the "Buy Now Button; above. You will come to the "Pay with a Paypal Account" first. If you want to use Paypal proceed with the "Paypal Sign In." 2. If you want to use a major credit card, or debit card look directly below the Paypal Payment Sign In and click the link, "Don't Have a Paypal Account?" *This will take you to the major credit card and debit card section and allow you to use your credit or debit card. The book that was sixteen years in the making for creative counseling / therapy groups. Dr. Stangline has put together all of her creative counseling group ideas in this 252 page eBook. This eBook is ideal for professional therapist, school counselors, social workers, and school psychologist who utilize group therapy for clients or students. Take the same play therapy class I teach to counseling graduate students! 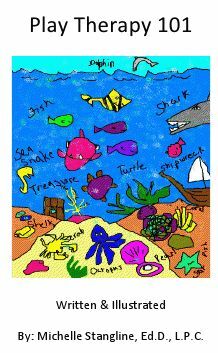 Learn the secrets of Creative Play Therapy.